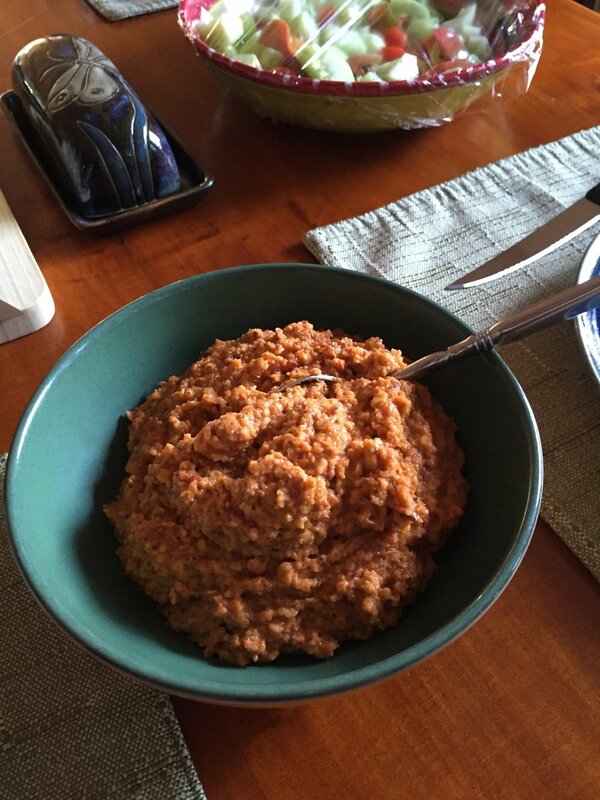 We love making romesco sauce every summer and freezing some for winter. 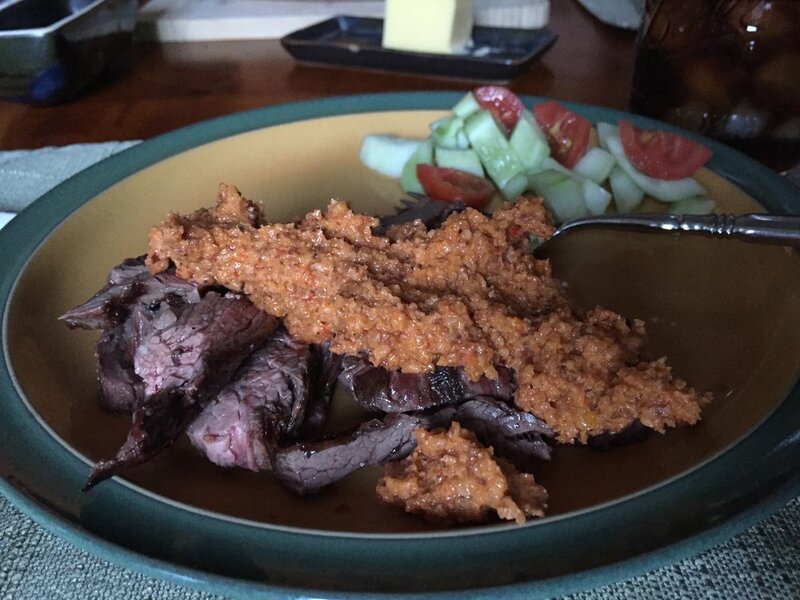 It uses up some of the harvest, and really tastes good with grilled steak. It's also good on fish, chicken, or pork. Or you could use it as a spread on a sandwich. Or with cheese and crackers. It's slightly spicy and full of flavor. I make a double batch; we have some with dinner and for lunch the next day, and the rest I put into mason jars. I cover the surface of the sauce with a film of olive oil (just like I would with pesto) to preserve the color, then I stash the labeled jars in the freezer. Taking this sauce out in dark, dreary January is a real treat. This is the recipe for a single batch. If you want extra to freeze, it easily doubles. Every recipe I read calls for hazelnuts; I have trouble finding those, so I just double up the almonds and skip the hazelnuts. Instead of thyme sprigs, sometimes I’ll use my own dried thyme and in that case, I never remove it from the tomato, just add it to the food processor. Preheat oven to 400. Place tomato in small glass baking dish, drizzle with olive oil and scatter thyme over. Season with salt and pepper. Roast until tomato is soft, about 20-30 minutes. Scatter the bread cubes over the tomato and roast another 10 minutes. Let cool and discard thyme. Meanwhile, char peppers directly over a gas flame or under broiler, until blackened all over. Transfer to a large bowl, cover with plastic wrap, and let stand for 15 minutes. Then peel, stem, core, and chop.